It is believed that the usual way of referring to the extent to which elevated any number, invented by Descartes. He, of course, did not come up with the idea about how this one and the design will have to enter from the computer keyboard. But if a civilization were able to create this very computer, and with something as simple as the font formatting in accordance with the usual standards of mathematical operations too. The other method applies to editors who know how to shift the baseline of individual letters and numbers up or down in relation to adjacent signs. This gives you the ability to use the usual "Cartesian" designation of the degree. Usually characters with this bias is called the "upper (or lower) index", and sometimes "Superscript (or subscript) sign". For example, in a text editor Microsoft Word to write the same number 1586 in the square, first dial 15862, then select last pair and click the icon with the x in the square. It is placed in the section "Font" section of the "Home" menu of the editor. When writing technical texts sometimes you need to write the square root. This is enough of the standard features of Word. You just need to choose the most suitable for the specific option. The easiest way to write the square root using the menu "Insert-symbol". To do this, select all the menu items Insert-Symbol... appeared on the screen, the label character set choose the sign of the square root, and then click "Paste". The square root symbol will appear in the text. (Usually a window with a set of characters covers a large part of the text, so the appearance of character not to notice). To speed up the search for a square root, select "set": "mathematical symbols". To see the full list of available symbols in the "from" field, you need to install the "Unicode (hex)". The choice of square root (or any sign) can be accelerated considerably if one knows the code for which there is a special field: "Code sign". For square root ( √ ) is "221A" (case is not important, "A" for English). Re-entering symbols easier to implement with the help of special panel "the Previously used symbols. If the icon is square root used very frequently, then here you can configure keyboard shortcuts or AutoCorrect options. The set of presented characters also depends on the font specified in the Font field - in some fonts the square root may not be. The fastest way to print the square root by pressing Alt and code square root. To do this, click Alt and hold down enter on the numeric part of the keyboard 251. If under the root sign is a complicated mathematical expression, then the icon of the square root is better to print by the editor of formulas. To do this, select the following menu items: Insert – Object – Microsoft Equation 3.0. This will open an editor for mathematical formulae, where, in particular, will be the square root symbol. 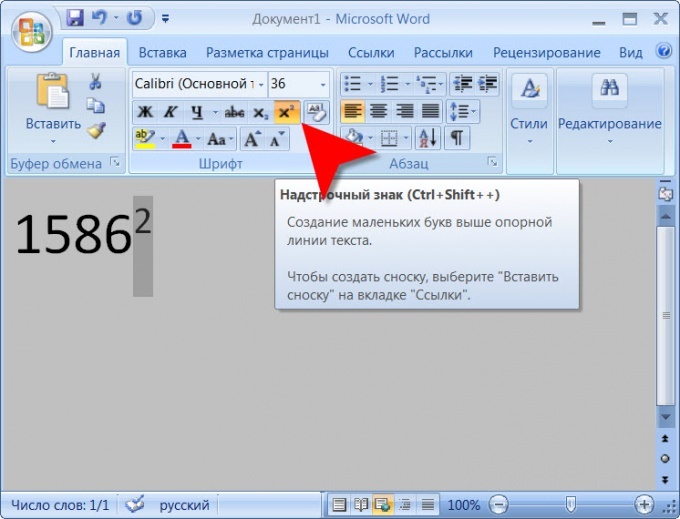 If the string "Microsoft Equation 3.0" is not in the drop-down menu, then when you install Word, this option was not installed. To install this feature, insert the installation disk with Microsoft Word (preferably one that you used to originally install) and run the installation program. Check the Microsoft Equation 3.0, and this string becomes available. The same way of writing in Word square root symbol. Select the following menu items: Insert – Field – Formula – Eq. Then open the editor for mathematical formulas. To write a square root using a combination of special characters. To do this, press Ctrl+F9. Then, appeared inside the braces, type eq \r(;1000000) and press F9. The result is the square root of a million. Of course, instead of 1000000, you can enter any desired, number... by the Way, the obtained expression can later be edited. 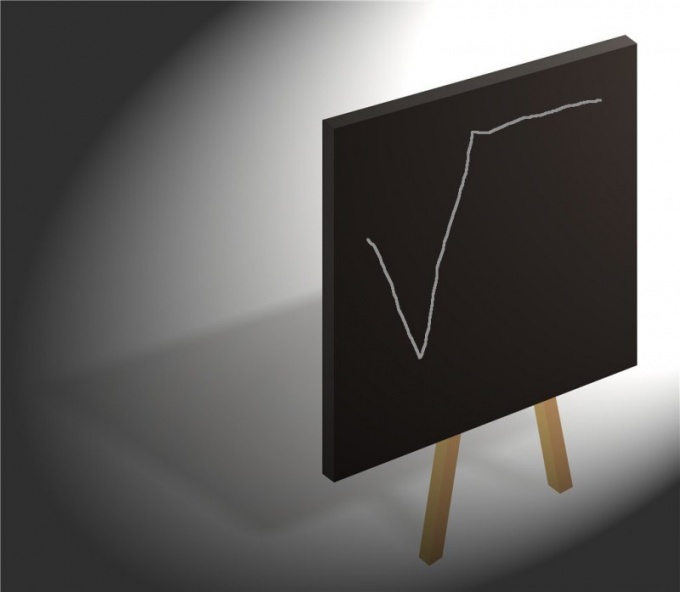 The square root can be drawn independently, using the built-in Word "graphic editor". To do this, expand the draw panel and draw a square root, combining the three lines. If the buttons for the drawing toolbar there, hit View – toolbars and put a check mark next to "Drawing". If under the root sign is planned to dial any numbers or expressions, then set the option "wrap text" on the "before text" or "behind text". All recommendations are designed to Word 2003 (XP). Writing a square root in other versions of Word are almost identical. When writing technical texts sometimes it is necessary to identify the root square. This is enough of the standard features of Word. You just need to choose the most suitable for the specific option. The easiest way to identify the root of the square via the menu "Insert-symbol". To do this, select all the menu items Insert-Symbol... In the on-screen plate with a set of symbols , select the sign of the square root, and then click "Paste". The square root symbol will appear in the text. (Usually a window with a set of characters covers a large part of the text, so the appearance of character not to notice). The choice of square root (or any sign) can be accelerated considerably if one knows the code for which there is a special field: "Code sign". For the square root (v) is "221A" (case is not important, "A" for English). The fastest way to identify the root of the square using the Alt key and code square root. If under the root sign is a complex mathematical expression, the square root icon to better define, through the formula editor. Write root square using a combination of special characters. To do this, press Ctrl+F9. Then, appeared inside the braces, type eq (;1000000) and press F9. The result is a root square of a million. Of course, instead of 1000000, you can enter any desired, number... by the Way, the obtained expression can later be edited. Square root can be drawn independently, using the built-in Word "graphic editor". To do this, expand the draw panel and draw the root of the square, connecting the three lines. All recommendations are designed to Word 2003 (XP). The symbol of square root in other versions of Word are almost identical. On the computer keyboard is missing the square root sign. The need to enter this sign may occur when the set of texts that contains mathematical formulas. Also operator input for square root extraction may be needed when programming in some programming languages. 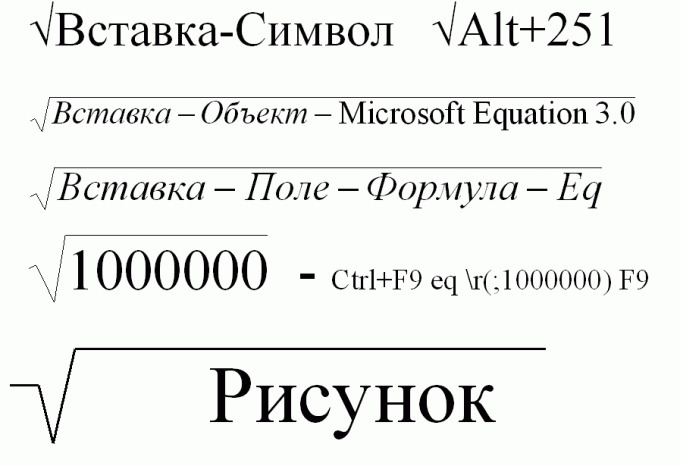 In the presence of the software package Microsoft Office component installed Equation Editor to run this component, and then press the function key with the symbol for square root. Enter the expression to be located under the root. In the absence of a component in the Equation Editor, and when working in other office suites, for example, OpenOffice.org or Abiword, in the table find the square root symbol. It looks like this: √. The output of this table depends on what editor you use. For example, Abiword is "Insert" - "Symbol". Locate the desired sign and click "Insert." To put under him the whole mathematical expression will fail, so it will have to be placed in brackets and placed to the right of the sign. Insert the square root symbol can be in a web page, provided that it is used for Unicode encoding. Get this symbol as described above, and then select it with your mouse, copy it to the clipboard (Ctrl+C), go to editor HTML code, place the cursor at the desired text position and insert (Ctrl+V). Single-byte encodings (KOI-8R, KOI-8U, 1251) do not contain a square root sign. If the web page uses this encoding, instead of the sign you can use its graphical image, which may look like this:c=/(a+b)in Addition, in this page, you can paste the entire formula as a whole in the form of an image:<img src=formulaimage.gif> where formulaimage.gif - the name of the image file of the formula. When programming in basic for the square root use the SQR operator. Note that most other languages (e.g., Pascal) this statement refers not to the root, and squaring (multiplying a number by itself). When programming in such languages remove the square root using the SQRT operator. The method of entry (lowercase or uppercase) select depending on the version of the interpreter or compiler.